The African Union, a continental union of 54 African countries, was established on May 26, 2001 in Addis Ababa. 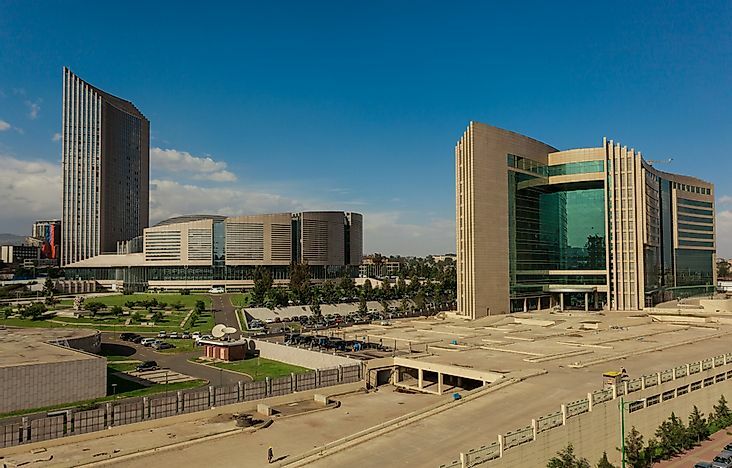 The African Union's headquarters complex in Addis Ababa. Editorial credit: christianthiel.net / Shutterstock.com. The African Union (AU) is a political and administrative organization, founded in 2002. It consists of 54 countries in Africa with its principal administrative capital located in Addis Ababa, Ethiopia. The headquarters are housed in the AU Conference Center and Office Complex. This building has 20 floors and a 2,500-seat plenary hall. The AU has several objectives, the primary of these is to promote and encourage unity among African countries and citizens. In addition, this organization works to retain the independence of its members, to promote peace and security, to protect human rights, and to advance sustainable development economically and socially. The AU originated from the Union of African States of the 1960’s, the Organization of African Unity (OAU) of 1963, and the African Economic Community of 1981. Criticisms of the effectiveness of these organizations led to discussions in the 1990’s between the Head of State of Libya and the Heads of State and Government of the OAU. In September of 1999, the officials created the Sirte Declaration, recording the need for the African Union. With the need established, various governments participated in summits to define the Constitutive Act (in 2000) and the implementation plan for the AU (in 2001). The first session was held on July 9, 2002 and headed by South Africa’s Thabo Mbeki, the first chairperson. Since then, sessions have taken place in several countries. The AU is divided into several bodies. The Assembly of the African Union is the most powerful branch of the organization and is made up of the Heads of Government of the member nations. The Assembly meets once per year to vote on legislation. Each decision must be made by at least a two-thirds vote. Additionally, this organization has a representative branch - the Pan African Parliament. Its 265 parliamentary representatives are elected by the national AU chapters. It is located in the city of Midrand in South Africa and serves to encourage democratic participation in the workings of the AU. The Executive Council, made up of foreign ministers, who prepare material to present to the Assembly for their discussion and approval. This Council makes decisions on issues of food, agriculture, foreign trade, communications, and social security. The Court of Justice of the African Union has decided on conflicts surrounding AU treaties since 2009. This Court will soon be replaced, however, by the African Court of Justice and Human Rights, which will act as a merger between the Court of Justice and the Court on Human and Peoples’ Rights. The Peace and Security Council was established in 2004 as a fast response to conflict and crisis situations throughout Africa. This Council is also responsible for preventing and resolving conflict as it arises. In addition, it is charged with resolving conflict and overseeing peace building post-conflict. The Assembly elects its 15-member body based on regional organization. Other branches of the AU include: the Economic, Social, and Cultural Council; the Permanent Representatives Committee; the African Commission on Human and Peoples’ Rights, and the New Partnership for Africa’s Development. The African Union must confront a number of obstacles in order to accomplish its goals. These issues include: the presence of authoritarian regimes, continuous occurrence of civil wars, extreme conditions of poor health and poverty, the need to improve the economy, and a lack of sustainable development and environmental policies. In terms of health concerns, African countries are faced with both malaria and HIV/AIDS epidemic. In fact, sub-Saharan Africa has the highest rates of HIV found anywhere in the world with million dying every year. In several countries, it is estimated that at least 20% of the sexually active population is infected. Here, this diagnosis reduces the life expectancy of its carriers by 6.5 years. Aside from being a tragedy and loss for the individuals and their families, this will also have a negative impact on GDP growth for the AU. This is particularly true in South Africa, which represents 30% of the entire AU economy. When ex-US President Barack Obama spoke at the AU on July 29, 2015, he addressed several challenges to the AU’s progress, including a lack of democracy and uncooperative leaders. This is seen in Libya, which was wrought by civil war in 2011. Additionally, the AU has worked to regain peace in several regional zones of conflict. These areas include: Darfur in Sudan, where the AU sent 7,000 peacekeeping troops in 2005; Somalia, where the AU worked to establish a transitional government after a period of around 20 years without a functioning government; and Anjouan in Comoros, where the AU stopped political unrest and an invasion set on gaining independence from Comoros. In addition to the previously mentioned challenges, the African Union has also set forth some very complex goals for the future. One of these is the creation of a United States of Africa or a Union Government. This organization has already drafted some proposals on how to form a Union Government, although some member states do not agree on the exact approach. Some of the future steps to be taken will include an increased urgency behind consolidating economic and political actions of African countries and an audit of the branches of the AU in order to strengthen the organization and move closer to a Union Government of Africa. As part of the goal to create a more united front in Africa, the AU has also established other future goals for its member nations. In order to improve trade and increase its import and export industries, the AU Assembly has set forth the mission of establishing a free trade area within its member countries. To smooth the transition of a free trade area, the AU is also planning to create a customs union and a single market. One of the complications of a united market in Africa is that each country uses a different currency. To this end, the AU has also identified the desire to create a common currency and a central bank. This idea was proposed in the African Monetary Union which plans to have a shared currency by 2023 and a central bank by 2028. The plan will be similar to the European Union.